In February, I had a special opportunity to travel to Baldwin County, Alabama and visit classes where I got some interesting ideas. At the time, I had little idea how much I would be able to incorporate some of the ideas as soon as I have. It was a unique opportunity to share approaches to learning across the country. I found great value in the trip and brought back some ideas that I explored immediately, but some were placed in my "ed bag" (my mind vault). One experience included observing students in a math class complete a Gallery Walk. Each student had a worksheet where they could work out math problems. 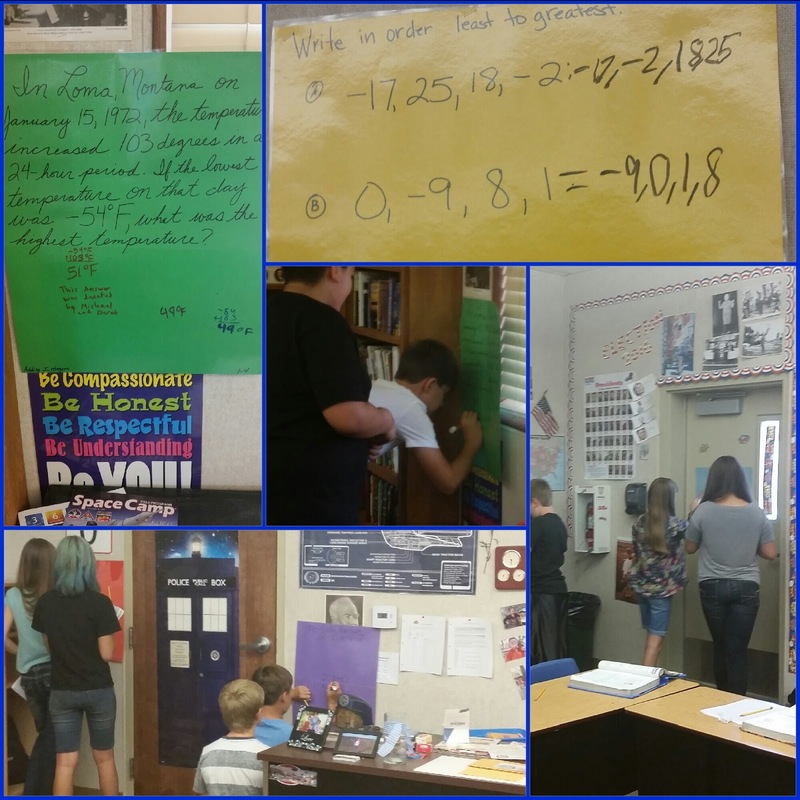 They worked in partners and walked around the hallway where their teacher had placed different posters with math problems on them. They used this opportunity to have a low-tech, high learning day where they applied the Pythagorean Theorem. Observing the students, talking with the teacher, and soaking in the learning happening was incredible. Flash-forward to last week. Over the summer, I had started hearing about Math 360. I took interest in it because as I started a new role at a new school, I would take on teaching one math class and becoming familiar with new ideas seemed like something I definitely should do. I browsed the Internet and looked at fellow educational Twitter users' Tweets about this approach to math learning. I wanted to know how I could do it. Going to the training and purchasing the available supplies was a little out of reach for me in the immediate future, but I could pull aspects of the learning approaching and incorporate it into my class. As I wrote my lessons for the week, I knew I wanted to incorporate what I could, how I could. Then, I remembered my Baldwin County experience. I took the two ideas and I blended them together. I made large posters with math problems for the current chapter. I laminated them and put them up around the room. 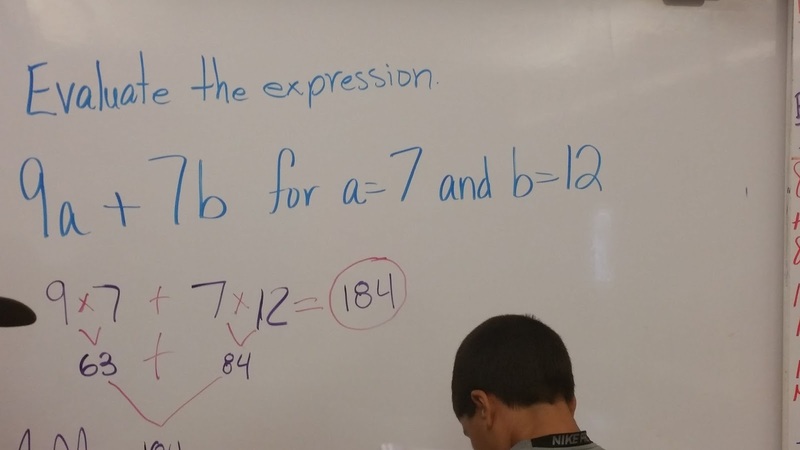 Additionally, I put one problem up on the white board and one on the SMART board. 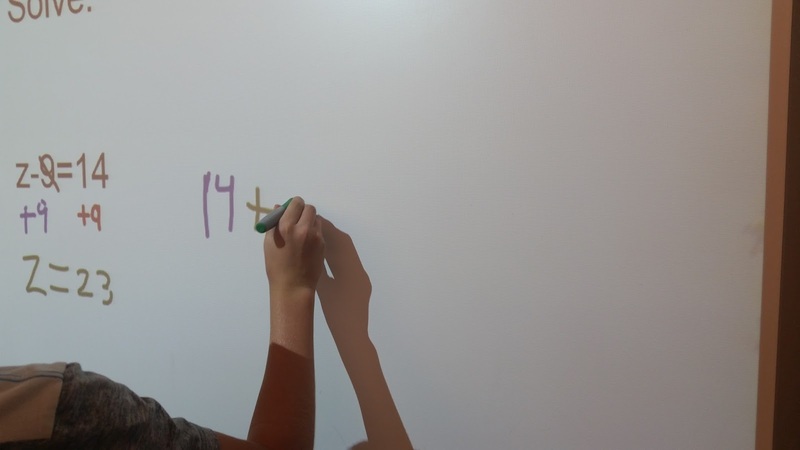 I broke the students into small groups and handed each group a dry erase marker. With their Interactive Notebooks in hand, students made their way around the room. Their task was simple: complete all of the problems in their Interactive Notebooks and take responsibility for solving at least two problems up in the room. They spent the entire class period making their way around the room and getting math practice. The next day, we came back together in the classroom and went through the problems as a class. This allowed students to correct their work. We identified specific issues together, they made their corrections as needed, and we were ready to move forward. As we reflected on the experience together, I came up with one modification. (We will do this again!) When we do this in the future, students will complete all of the problems in their Interactive Notebooks, then when we come back together, each group will take a turn leading through the steps of one or two problems with the class. 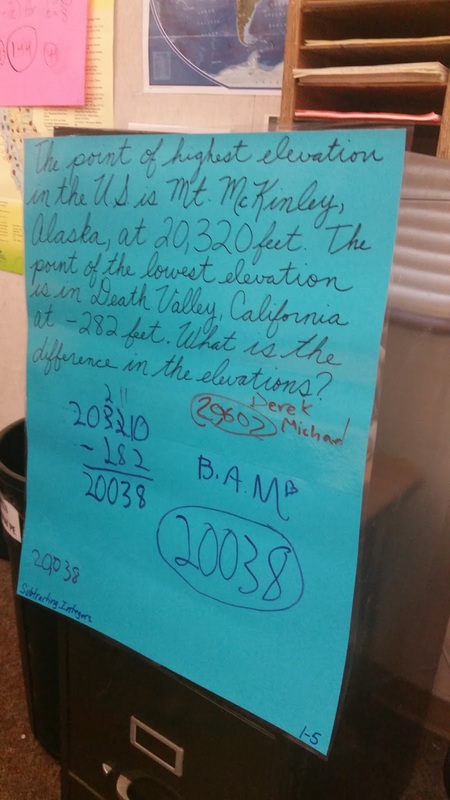 I left the posters up around the room to show parents at Back to School Night, too, so they could see what their students did in math during our first full week of school. We are off and running and it is #EduAwesome without a doubt! A splash of color, a little song, and creative learning rocks! I recently started using a planner. I still love my Google Calendar and I use it for everything. It's ease of use makes life easier. My planner allows a different sort of organization and creativity to emerge. 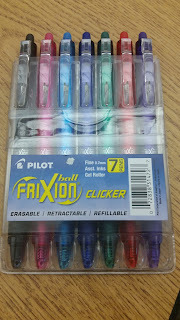 In that, I received a pack of gel pens from my very best friend. It has allowed me to color code my planning on paper similarly to how I color code on my Google Calendar. It's fantastic! 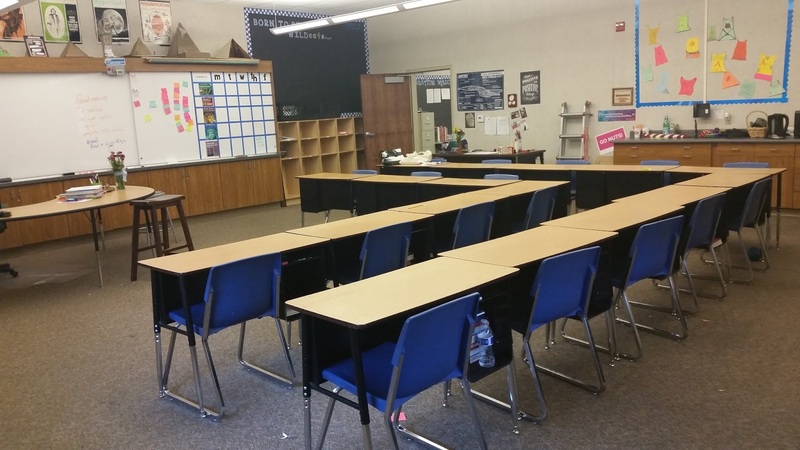 Last week, I brought that organizational technique into the classroom. I am using a varied approach to my math instruction this year. I am incorporating different approaches in instruction and learning to reach all students. One thing I started with students was the use of an Interactive Notebook. As we make notes together, I color code with my set of gel pens. I have encouraged students to color code as well. 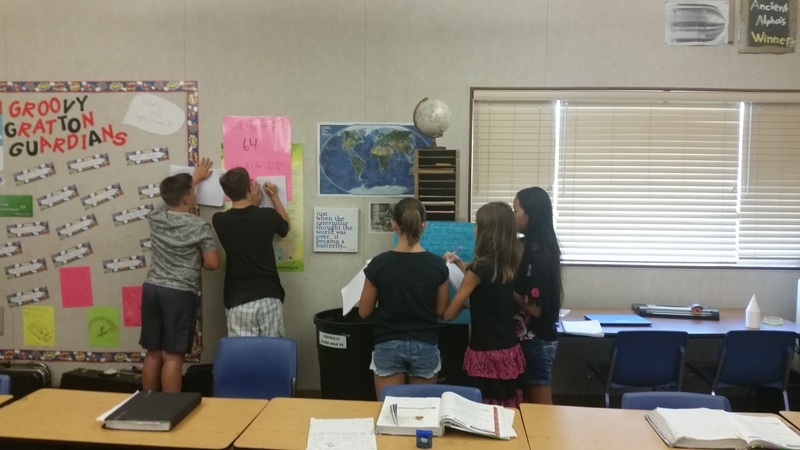 It allows them to get creative while keeping their notes organized. Today, I modeled for them how I would be ok with them using gel pens. 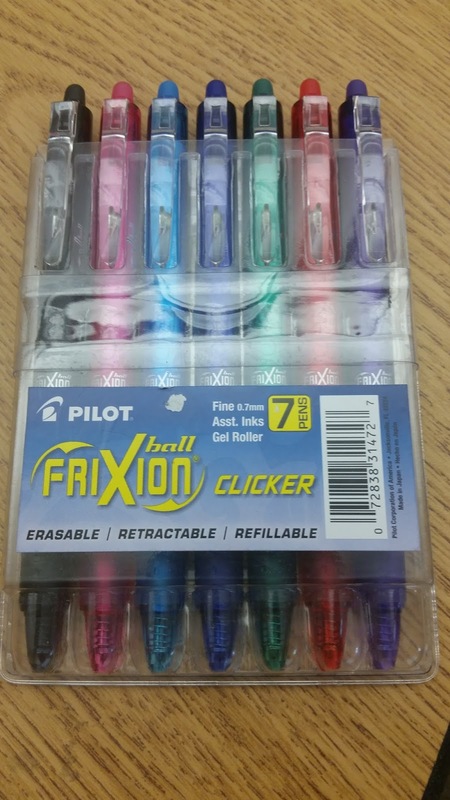 Erasable gel pens! Make a mistake? That's ok, erase it, rewrite, and move forward. The colors have engaged them in their note taking and takes some of the potential drudgery out of it. s ROCKED this assignment. 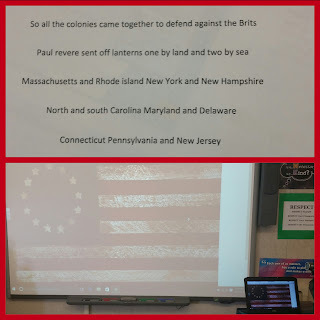 One group wrote a song and choreographed their whole number, one group did the whole song creation using technology tools such as Audacity and a voice sounding much like Stephen Hawking came across with the lyrics, another group sang a beautiful tune, another did a rap with a Yankee Doodle underscore to it. 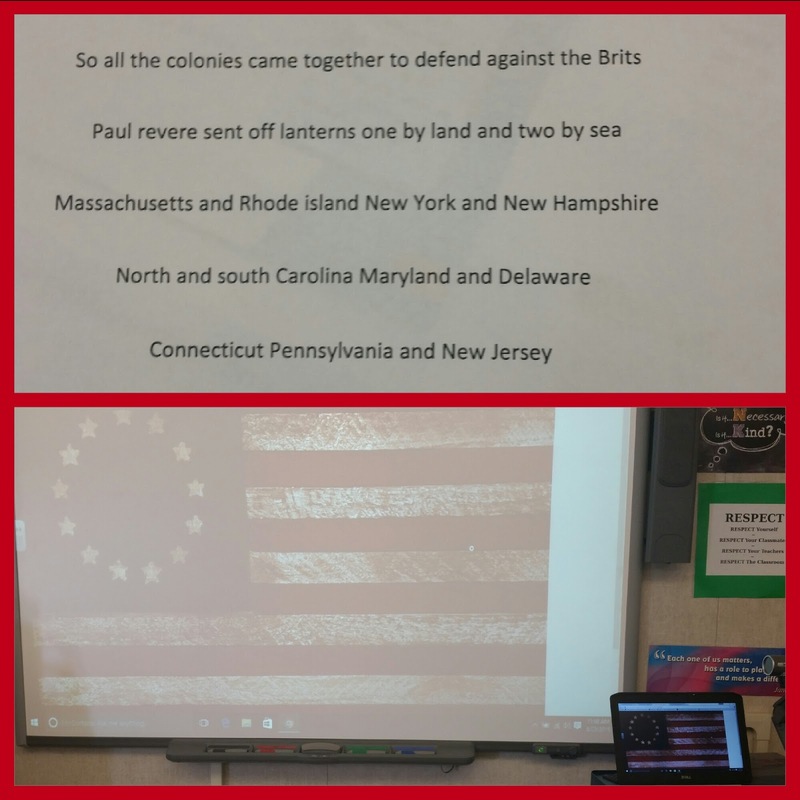 Today, we heard very different songs from each group and got to know the 13 colonies just a little bit better. During tonight's TOSA Chat, I mentioned that one of my goals for the year is to allow more creativity in learning within the "regular" classroom and I think we're off to a great start! With the start of a new school year, comes the start of many new beginnings. This is especially exciting as with the start of a new year, I meet new students in a new classroom at a new school. With this new school year, I return to a more traditional teaching role and I see the EDventure in it all. 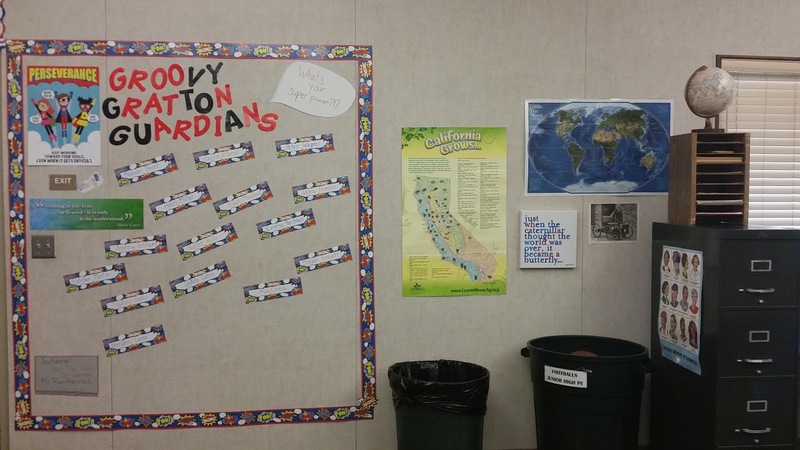 As I entered the new classroom to prepare it for the start of the year, I looked over bulletin boards that remained on the walls as I walked in with some of my own supplies. I always like to create an environment that sets a good example. For a couple of years, I put my run medals up on a small bulletin board to let students know that anyone can do anything that they commit to doing. I also like to encourage creativity and spark conversations where I can learn what interests my students while showing them things that interest me. One such conversation starter is my TARDIS door poster. 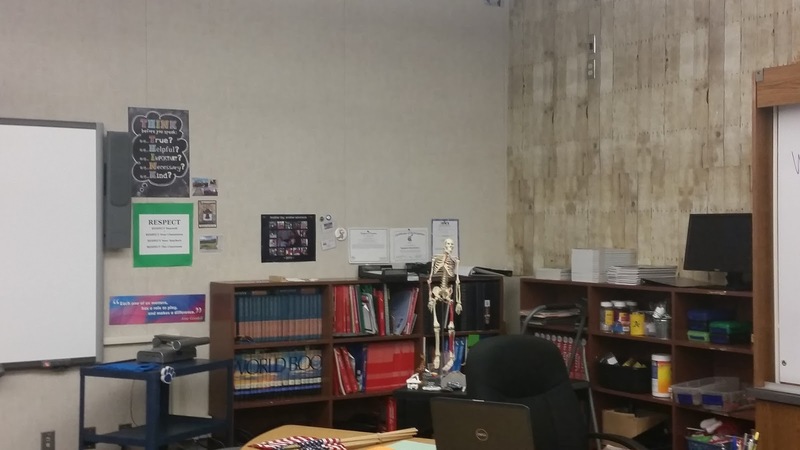 This year, I knew I had more usable wall space that was ready for bulletin boards. 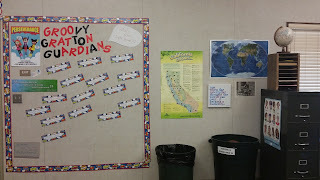 At first, I thought I might keep some of the existing bulletin boards as they were. Then, I thought again. I need to add my own self to it, I need to make it a space for the students, and we need to make it our creative learning environment. I kept shadows of the previous teacher. 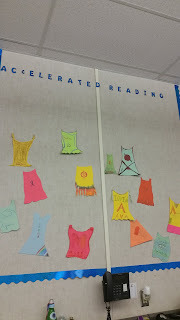 for example, the Accelerated Reading board is in the same spot. It, however, has a different look and feel to it. We will celebrate all AR accomplishments with a flare of individualism. I set up the bulletin board, but left it open. 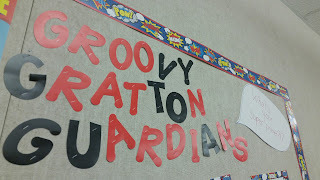 I created a space with a superhero theme, which happens to be the theme for the classroom this year. I used trim and added "What's your super power?" after adding the students names on superhero name cards. I decided against using a bunch of brightly colored bulletin board paper to cover sections of the walls and left the more neutral bulletin background in most areas. I simply used trim to section out areas. It's calming but powerful. I found previously, that I really like a horseshoe or double horseshoe for seating. Students can break off easily into groups as needed and it works very well for class discussions and presentations. I went with a modification of that to start the year. I may adjust ever so slightly. But, more on that in a moment. As I prepared to transform the room, I came across a blog post that fit with the direction I like to take my room, but had some advice I knew I needed to heed. Exploring the Science of Effective Classroom Design was exactly what I needed to read, exactly when I needed it. I do well with my classroom design generally and seeing the science of it was fabulous. This offered me a chance to modify a few things. For instance, with it, I decided less was more and opted to hang fewer things up on the walls ahead of the start of the year. There are still conversation starters, such as the TARDIS and there are inspirational quotes that I put up at varying levels around the room. There are a few images of famous Americans and people relevant to our course of study. There are things that will inspire students. I also made sure the designate certain spaces to which the students would contribute. For instance, the AR board. I designated the space, now the students would help fill it. I wanted to inspire rather than distract and I moved in a very positive direction. 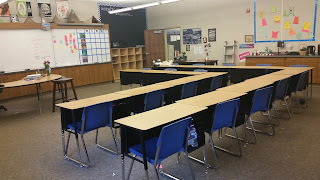 I did my modified horseshoes and I brought in a teacher desk while leaving a table at the front. 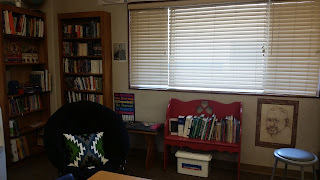 I have stools around the room for students or for me depending on the day's activities. My reading corner was an immediate draw. As I dreamed of returning to a more traditional teaching role, part of that dream was having a reading corner. There are lots of books to choose from and there is a nice, new reading chair. This chair will also serve as part of an incentive program I have established for the year. Each month will have a Student of the Month. That student can choose one day to sit in the chair for the day. Otherwise, it is available to students on a first come, first serve basis in the reading corner only. So, how did it all come together? It looks great! On the first day of school, I had only the eighth graders. I helped establish the space as OURS. 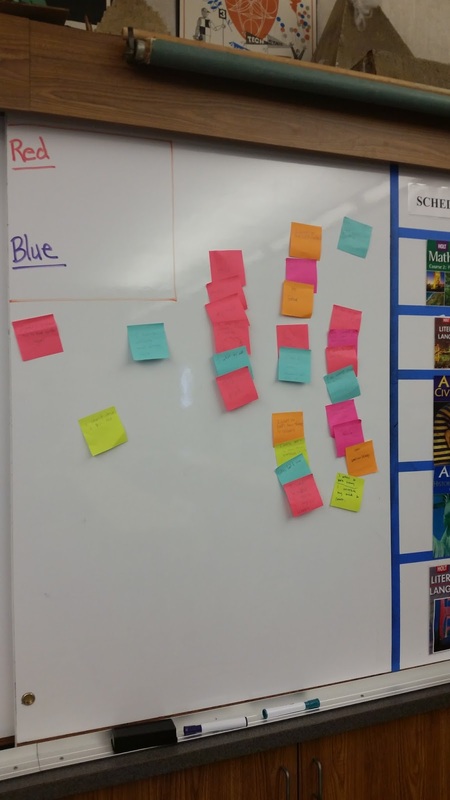 When I handed out sticky notes and invited students to write down questions, one student wrote, "will there be more stuff on the walls?" PERFECT! 8th graders who loved the idea! The students designed their AR superhero capes and we put them on the AR board. 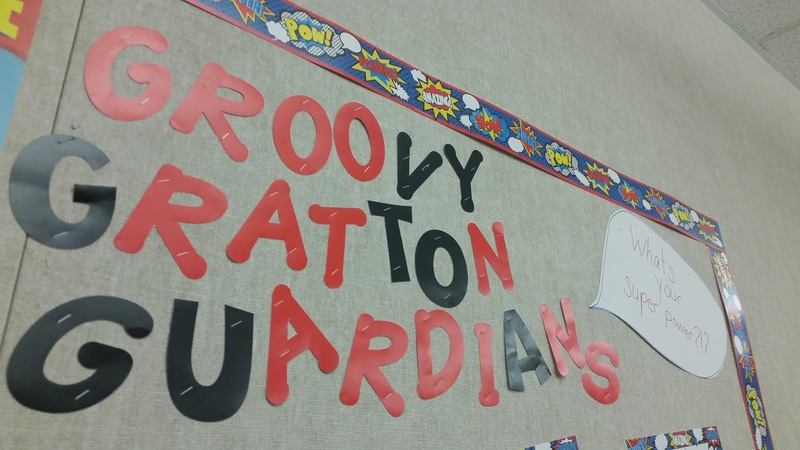 As they reach AR goals, they will earn stickers to add to their capes. In groups of three, they designed a comic book cover illustrating what they thought the year ahead would have. Then, they went around the room to look closely at what was already hanging and we discussed the people, places, and things they found most interesting. Their first "homework" assignment was to find out something interesting about four current presidential candidates. They received bonus group points if they brought in images. We will add those images to the Election 2016 board. The homeroom students have already established a since of ownership and creativity in the classroom. It all started with a less is more approach and a few conversation starters. I also learned more about who prefers Star Trek to Star Wars (and vice versa), who watches Doctor Who, and who knew who John Steinbeck was. I learned about things they are interested in doing as a class. And they learned a little bit about a new teacher who will work to get them digging deeper, thinking more, and asking questions. A teacher who wants to guide them in their learning and in becoming thinking members of society as they move forward in life. A teacher who really is a facilitator of learning. I am the facilitator and the room is the facility? What changes have you made to start the year? Where do you see if leading you? More importantly, where do you see it leading your students. Let's make it an EduAwesome Adventure for all!